The fact that women have their breasts enhanced with silicon has very little to do with Tissue Engineering and a lot to do with material and waste management. from impaired hearing since their earliest childhood, leading to a significant improvement of their hearing abilities . What sounds like a miracle will take us closer to the topic of Tissue Engineering (TE). What would be worse: being deaf or blind? There are almost 50 million blind people throughout the world, with one person in Europe going blind every five seconds. This blindness is predominantly caused by degenerative illnesses with age-related Macula degeneration (AMD) and Retinitis pigmentosa (RP). Now the introduction of an electronic optic chip gives people with RP a ray of hope . With their retina implants, biomedical experts from Tübingen and engineers from Reutlingen have created a grand masterpiece, which will be of inestimable value for those affected. However, the chip does not denote actual healing; it is and remains a silicon-based visual aid. Could an impaired or even blind retina be fully, or biologically, healed in the future? Many treatment methods must still be improved, as medical measures and medicinal treatments often concentrate on symptoms rather than contributing to actual healing. Can regenerative medicine, can Tissue Engineering, promise us more hope; and can it keep these promises? Fig. 1 Stem cells (yellow, grey) are characterised by two basic properties: their proliferation capacity and their differentiation potential (blue, red, various cell types). The required gene switches, signal routes and growth factors are only partially known. Tissue Engineering – Hope or hype? to produce cell types required for the tissue through the targeted addition of growth factors (differentiation potential). Table 1 provides an overview of the most common stem cell types. They all display distinct advantages and disadvantages, such as poor multiplication or differentiation abilities, later susceptibility to tumours, and last but not least, ethical concerns. Tumour formation in the implanted tissue cannot be excluded even in the iPSCs, which are favoured as the ideal solution . Fig. 2 Schematic section through the human eye. 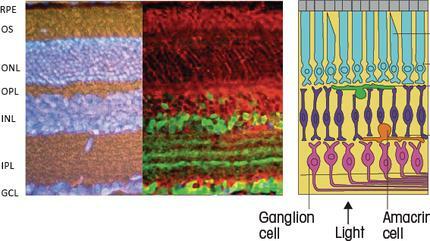 Fig.3 Cell layers, cell types and cell interconnections in the retina. All cell bodies are concentrated in three „nuclear“ granular layers (left, blue). Centre: the various cell types are identified with specific markers: in this case Müllerian radial glial cells (red) and certain amacrine cells (green), whose dendrites form synaptic sub-bands in the IPL. Right: a simplified circuit diagram of various cell types. Light incidence from below. RPE, retinal pigment epithelium; OS, outer segments; ONL, outer nuclear layer; OPL, outer plexiform layer; INL, inner nuclear layer; IPL, inner plexiform layer; GCL, ganglion cell layer. Was everything to date just hype or is there also hope in stem cell based TE? TE has grown into a huge research and industry project during the past 10-15 years. Research into cases such as diabetes has proved to be very promising. Embryonic stem cells (eSCs) were differentiated into beta cells in vitro and they were actually able to improve blood sugar levels in a diabetic mouse. TE has also grown significantly in the cartilage and bone replacement field (some readers may well remember the famous „ear mouse“) and has also found its way into dental surgery. Although, the classic skin graft will not be replaceable for high-degree burns in the near future, in vitro-cultivated human skin can now already be purchased as a finished product or cultivated from adult stem cells of hair follicles from the patient himself. Ten hairs of the patient will allow for cultivation and grafting of at least 25 cm2 of skin . Fig. 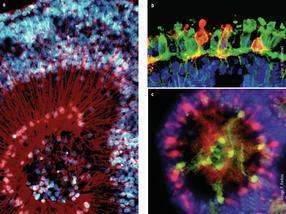 4 Production of cell spheres (retina spheroids), from the eyes of five-day-old chicken embryos. After removal, the retina is enzymatically disassociated into cells; these are then re-aggregated in a culture dish on a rotation shaker (refer to Fig. 9). Even cell spheres will form within two days. The conventional method of cultivating cells in vitro is to seed cells into a plastic dish, supply them with culture medium and then allowing them to spread while they adhere to the base of the dish. Unfortunately, these cells often displaye very little similarity to the initial tissue because they lacke the natural three-dimensional cell environment. Years ago, Nature had already titled this „Goodbye, flat biology“ , but the spread of 3D cultures is still limited due to their high labour intensity. Organ typical cultures are used to cultivate a variety of tissue types, which could also be therapeutically applied; in this case, one would typically assume re-aggregated cell spheres (cell spheroids). This approach is used for the attempt to achieve full reconstruction of the desired tissue starting with only a few (stem) cells under controlled conditions. The measure of frequently observed self-organisation can be considerable. 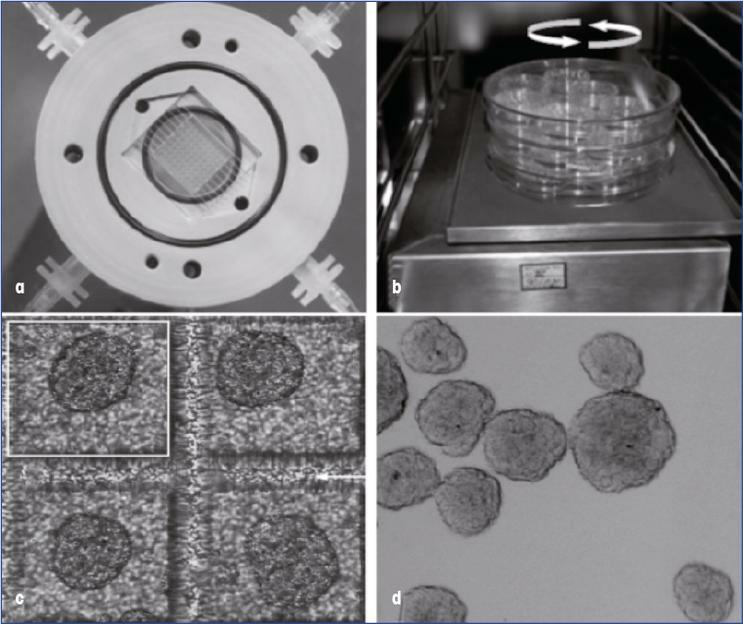 With the right parent cells any further processing is technically simple: the cells are placed in dishes and kept in permanent motion with the use of a rotation shaker. The cells re-aggregate quickly, begin to multiply and can be brought to the desired differentiation in a suitable culture medium. At the same time, the created cell types begin to spatially arrange themselves in the cell sphere, whereby the formation of organ typical structures can be accurately analysed cell by cell within days or weeks. This approach was used to analyse both the formation of various embryonic tissues and the regulation of cancer cells. Neurospheres of eSCs from blastocysts are similarly cultivated with the so-called Hanging Drop method. Fig. 6 An almost complete reconstitution of a chicken embryo‘s retina (left) compared with a normal retina (right). The spheroid was created from fully disassociated chicken embryo retinae in the presence of RPE supernatants. 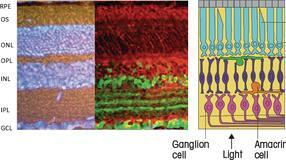 Colouring: DAPI (blue) shows the cell body layers (GCL is false-coloured in green); rod photoreceptors are red. 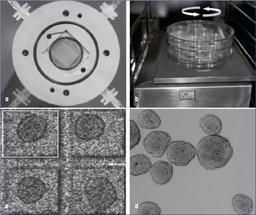 These procedures will now be illustrated [6, 7] based on the example of retinal cell spheres, which are cultivated from developing vertebrate eyes (Fig. 2). 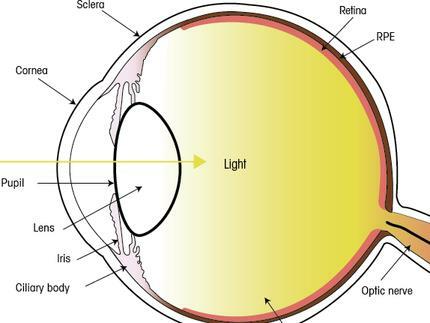 The retina represents the light-sensitive tissue in the human eye (Fig. 3). It is of special interest to neurobiologists as it is easily accessible from the outside and its threefold cell stratification is comparable from the fish to the human being. The outermost layer contains photoreceptors in the form of rods and cones, which at the outer synaptic layer (OPL), are connected to horizontal, bipolar and amacrine cells as inter-neurons in a central cell layer (INL). These in turn are connected to the ganglia cells (GCL) in a broad inner synaptic layer (IPL), whose axons conduct the already highly processed electrical signals through the optic nerve to the visual cortex in the brain. The retina is radially stabilised by the Müllerian glial cells that traverse the tissue; it is outwardly encased by the retinal pigment epithelium (RPE). Fig. 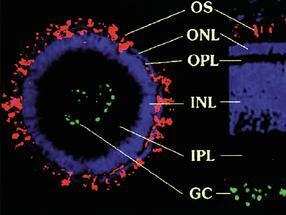 7 Detection of individual cells in the retina spheroid. 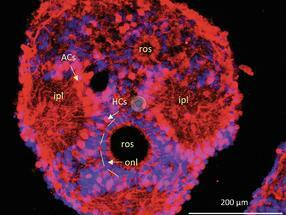 (a) Müllerian radial glial cells (red) traverse the entire layering in a stratified spheroid from the chicken embryo (comp. Fig. 6). (b) Rods (green) and cones are correctly located in the outer cell layer and begin to differentiate. 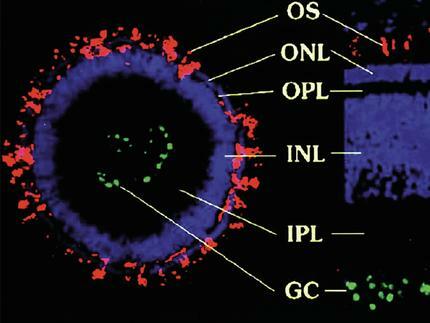 (c) IPL-like area in a rosette spheroid (comp. Fig. 5), where amacrine cell dendrites form synaptic sub-bands (comp. Fig. 3). Colouring: green, choline acetyltransferase; red, calretinin; blue, DAPI for cell body. The retina model system allowed for an optimal study of extensive in vitro tissue regeneration. If disassociated retinal cells are taken from the earlier chicken embryo and brought into a rotation culture; they will form approx. 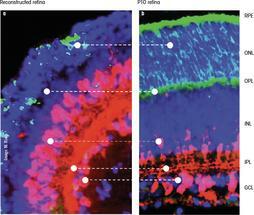 400 µm thick cell spheres within a few days, displaying internally layered units comparable with a normal retina (Fig. 4). Inner rosettes initially still contain proliferating cells and then photoreceptors (Fig. 5) at a later stage. The cell bodies of rods and cones even begin to form outer segments. With the exception of ganglion cells, all cell types are found at respective locations. Radial Müllerian cells pass through these layer arrangements and collect in circular matrices corresponding with the inner plexiform layer of a normal retina (Fig. 7c). The differentiation of various cell types and their synaptic interconnection can be histologically, biochemically or physiologically monitored and depends on the respective cultivation conditions. Photoreceptors, therefore, form more easily in the presence of Müllerian cells and/or certain growth factors [8-10]. Fig. 8 An extensive reconstruction of mammalian retinae is also possible in vitro. Structure of a 10-day-old (P10) gerbil retina compared with the almost complete reconstruction in a retinal spheroid (a), which was cultivated for 10 days in the presence of RPE supernatants and Wnt-3a from the dispersed individual cells of a P1 retina. Colouring: blue DAPI for cell nuclei; red calretinin for amacrine and ganglion cells; green CERN-901 for rod photoreceptors. However, rosette spheroids are still far from corresponding with a normal retina, because the arrangement of layers is inverted. The photoreceptors are turned inwards like a rosette, with the other layers connecting „outwards“. Are there ways to achieve normal cell layering in these cell spheres? To a small extent TE still resembles medieval alchemy, in which „trial-and-error“ may lead us to the right ingredients for a culture medium, as it was in this case. Earlier studies of lower vertebrates had revealed that the retinal pigment epithelium can favour retina regeneration. Following this line of thought, we were able to completely change the structure of rosette spheroids in the presence of RPE, so that normally layered spheroids were formed (Fig. 6, 7). Müllerian glial cells were also able to induce these Strato-spheroids. A Japanese group then identified the participation of the Wnt-signalling cascade during this process. We were further able to extend these studies to various rodents and, thus, to mammalian retinae (Fig. 8). Although, the focus of this contribution is on the cultivation of whole tissue, i.e. on the topic of TE, we must emphasise the basic gain in scientific knowledge, which can be achieved with cell spheroids. Spheroids are easy to genetically transfect, i.e. 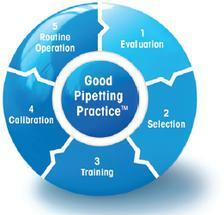 are suitable for gain- or loss-of-function experiments and can be histologically, as well as molecularly analysed. Their development for high-throughput procedures  should lead to increased utilisation as analytical systems in toxicology, pharma­cology and in environmental monitoring (Fig. 9). Which stem cells – embryonic or adult? The specified studies were performed with chicken embryo or postnatal mouse retinae, i.e. with in principle foetal stem cells, and have proved that these cells have significant self-organisational abilities of functional retina tissue. This, naturally, does not imply the possibility of therapeutic use. Numerous biological and technical challenges still need to be mastered, such as issues regarding the implantability of spherical tissue, or the development of biocompatible materials as degradable auxiliary structures (scaffolds) . Numerous teams, especially in Japan, the US and England are searching for suitable source cells and therapeutic procedures. David Gamm‘s group (Madison, Wisconsin) was able to cultivate highly textured retina spheroids from human eSCs that are similar to those derived from prenatal mice. Studies with eSCs from various mammals and humans also suggest that textured retina spheroids can be developed into photoreceptors or even into retina-like structures in the eye. This may again lead to tumours. Should this make adult SCs the cells of choice, then cells of the ciliary body or the iris, as well as RPE or isolated Müllerian glial cells, would be worth considering. They are all more or less easily isolated from the eye and can be multiplied in vitro and trans-differentiated into retinal cells. Whether ­it can then be directly planted into a damaged retina or whether retina tissue first needs to be cultivated using TE (as described here), still needs to be determined by ophthalmologists. We are undoubtedly experiencing exciting times right now with regard to the development of cell-based treatments in experimental ophthalmology. Although the human retina normally shows no signs of regeneration once it has been damaged, trials on lower vertebrates have indicated that there are cells in the adult eye with slumbering regenerative abilities. The approaches described here, with regard to embryonic, foetal and adult stem cells, identify ways which could actually lead to a reconstitution of human retinal tissue using tissue cultivation. Although we seem to have come a long way with eSCs, and also with iPSCs, the threat of subsequent tumour formation cannot be excluded and requires further research, focusing on possible cell sources from the adult eye. (Due to spatial reasons this presentation had to be significantly abridged; refer to the more detailed version in , PDF available from author). Pandit, S. et al. (2011). Stem cells, Feb. 2011, DOI 10.1002/stem.609. Zrenner, E. et al. (2010). Proc.R.Soc.B, online Nov 3, 2010. doi: 10.1098/rspb.2010.1747. Wobus AM (2010). Bioessays 32, 993-1002. Atala, A. et al. (2007). Principles of regenerative medicine. Academic Press. Abbott A (2003). Nature 424, 870-872. Layer, PG et al. (2002). Trends Neurosci 25, 131-134. Layer, PG et al. (2010). Exp Rev Ophthalmol 5, 523-544. Rothermel, A. et al. (2005). Tissue Eng 11, 1749-1756. Rothermel, A. et al. (2006). Invest Ophthalmol Vis Sci 47, 2716-2725. Frohns, F. et al. (2009). Eur J Neurosci 29, 1931-1942. Rieke, M. et al. (2008). Lab Chip 8, 2206-2213. First publication: Layer, P. G., q&more, 1.2011.